Clark Stationery - Carlson Craft - Golden Elegance Table Numbers. To see all designs from Carlson Craft click here and be directed to a sister site. Item Name: Golden Elegance Table Numbers. To see all designs from Carlson Craft click here and be directed to a sister site. 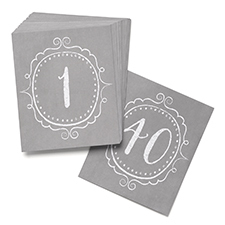 Description: 6" x 5" table numbers 1-40 with gray paper and white lettering. Many more designs her: click here and be directed to a sister site. Pricing: To see all designs and pricing from Carlson Craft click here and be directed to a sister site.